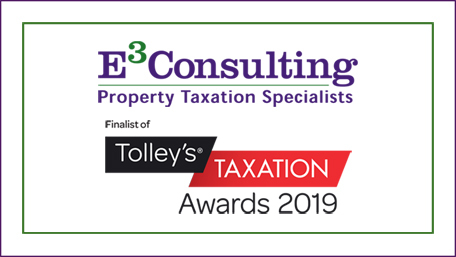 E3 Consulting was pleased to have been shortlisted for the Best Independent Tax Consultancy Firm award in the Taxation Awards 2019, especially in this our 15th Anniversary year. E3 are one of five firms in this category, and this will be our forth shortlisting in the last ten years – having won the category in 2011. “We are absolutely thrilled to have again been shortlisted for this prestigious tax award. The E3 team has worked hard over the last 12 months to help our clients find their way through some truly complex tax legislation. It’s always wonderful to have our expertise recognised at a National level, and amongst other industry leaders. It’s all the more poignant given that we are just concluding 15th anniversary year, so this tops a fantastic year for the firm.” says Alun Oliver FRICS, Managing Director of E3 Consulting. We look forward to attending the awards at the London Hilton Hotel on Park Lane on the 16th May. Fingers crossed for the final results!